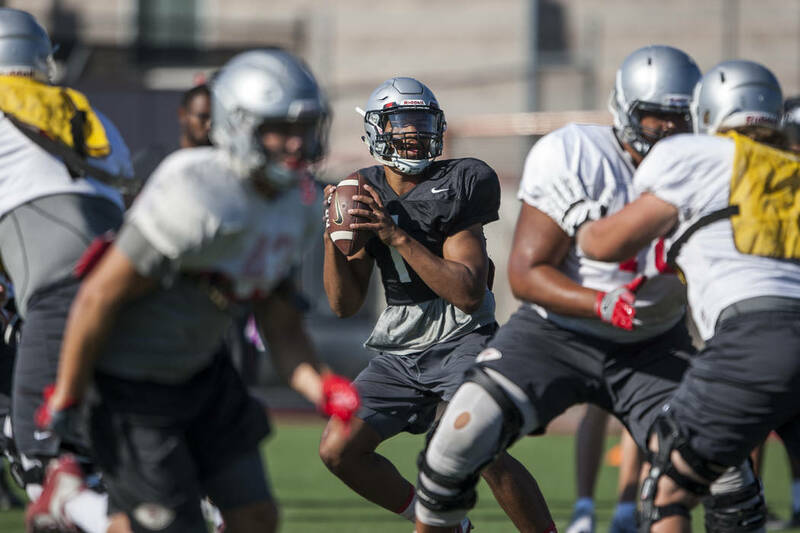 UNLV’s football team enters the season with plenty of questions. Some of those answers will come against Howard on Saturday at Sam Boyd Stadium. UNLV goes into its first football game of the season knowing it has a set of running backs and receivers that can compete with any in the Mountain West, and the Rebels bring back an experienced offensive line that helped generate more than 30 points per game last year. Then there is what they don’t know. Much will be revealed when the Rebels take the Sam Boyd Stadium field at 6 p.m. Saturday to face Howard. “I’m excited to watch these guys play,” UNLV coach Tony Sanchez said. “They’re a talented group of young men. They’re fun to coach. They come in with energy every single day. It’s not like pulling teeth. They enjoy the process. We’ve finally got a group that enjoys coming in and being around each other, understands that it’s going to be hard every day and is accepting of that. Not all questions will be answered in this game, especially if UNLV wins easily as expected. Only so much information could be gleaned from an expected blowout of an FCS opponent. Should the game, however, be much closer than the 36½-point spread posted at the Golden Nugget, then that will raise more questions than UNLV had before kickoff, probably none of them good. The two main questions for now are at quarterback and on defense, and for wildly different reasons. Armani Rogers will make his first start, and expectations are higher than the Stratosphere he is the quarterback this program so badly needs if it’s going to turn around in Sanchez’s third season. But Rogers is a redshirt freshman, and the pressure will be enormous. How will he respond to success? How will he respond to failure? Rogers and the offense should be able to move the ball against a Bison defense that gave up 34.8 points per game last season. As for UNLV’s defense, it’s largely made up of inexperienced players, and change in this case could be positive. The Rebels allowed 36.8 points last season, and they haven’t allowed fewer than 30 points per game since 2007. Training camp showed the Rebels should be more athletic, but that doesn’t mean the defense will make enough stops on a weekly basis to give its offense a fair chance. And playing Howard, which last season averaged 18.9 points, probably won’t provide many clues. But it will provide some, and UNLV will be challenged to stop Howard running back Anthony Philyaw, who last season rushed for 1,230 yards and nine touchdowns. Freshman quarterback Caylin Newton, whose big brother Cam is the QB for the Carolina Panthers, also figures to test the Rebels with his ability to run and throw. Even so, this is a game in which UNLV needs to make a statement, that the optimism the Rebels have of reaching a bowl for the first time in four years is justified.